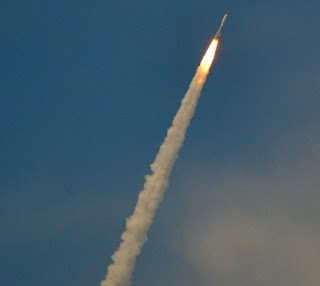 CAPE CANAVERAL, Florida -- The Atlas V 531 rocket launched successfully from Launch Complex 41 at Cape Canaveral Air Force Station on Friday, May 3, 2012 at 2:42 p.m. Eastern Daylight Time. This was United Launch Alliance's fourth launch of an aggressive 11 launch mission schedule for the year. The United Launch Alliance rocket will carry an Extremely High Frequency-2 (AEHF-2) communications satellite for the military. The AEHF system is the successor to the five-satellite Milstar constellation which will provide improved and highly secured communications for national security purposes.